Escalators… these effortless inclined elevators have moved millions over the past century yet are usually dismissed as utilitarian urban appliances. Not so – escalators today exhibit a multitude of designs and many display unexpected design features. 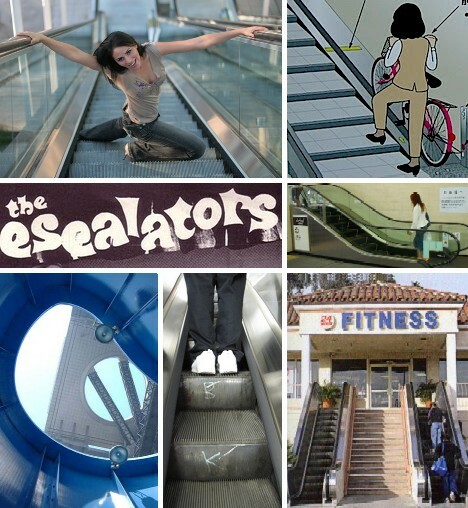 These 10 extreme escalators are a step ahead in pedestrian transportation and as triumphs of civil engineering ensure nothing is “lift” behind. 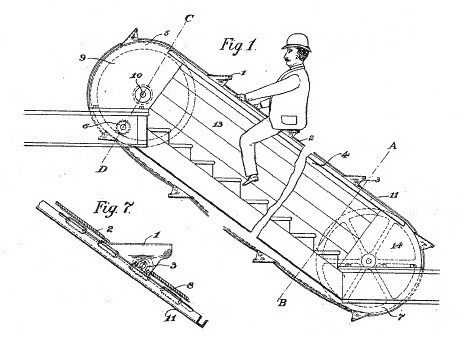 Though the U.S. Patent Office first awarded a patent for plans describing a device that purported to be an early escalator in 1859, the first working model wasn’t built until almost a half-century later. Several inventors introduced escalators as the turn of the 19th century approached, the most notable being Jesse Reno whose “inclined elevator” was set up as a ride at New York’s Coney Island amusement park in 1896. It looked like a ride: more like a hobby-horse than an escalator. Clearly some refinement was in the works, and Reno’s patents were eventually bought up by the Otis Elevator Company. Early escalators had stairs made of wood – which happens to burn, unfortunately. 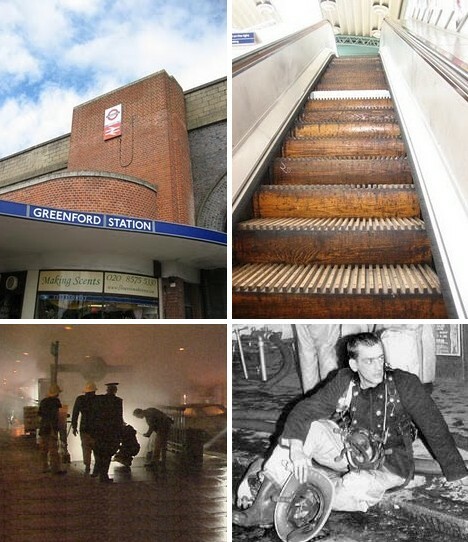 One of the most notorious escalator accidents in history occurred on November 18th, 1987, when a fire fanned by drafts in London’s Underground subway network killed 31 people. The fire at King’s Cross St. Pancras station started beneath a wooden escalator built shortly after the Second World War. Following the tragedy, most of London’s wooden escalators were removed and replaced; some of the last remaining ones can be seen (and ridden) at Greenford Station. Russia’s Moscow metro is very much a work in progress with initial construction beginning in 1931 and the first line opening to the public in May of 1935. 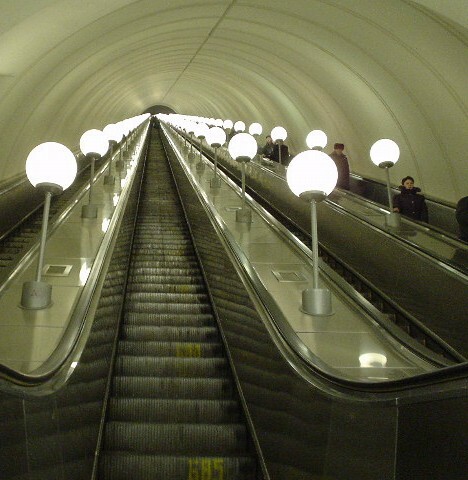 Park Pobedy station on the Arbatsko-Pokrovskaya Line opened in 2003 and features escalators 126.8 m (413 ft) long, containing 740 steps. 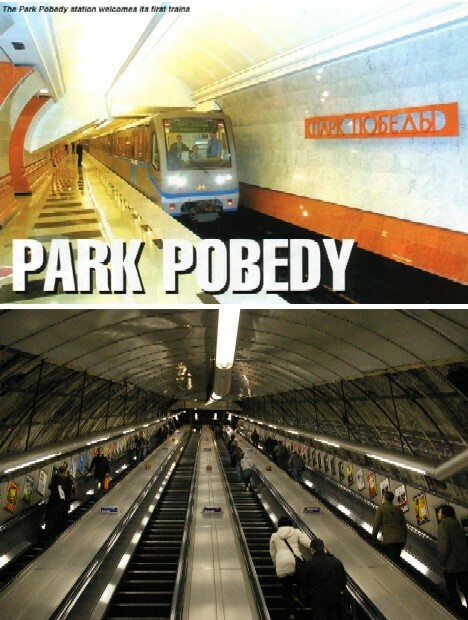 From start to finish, a ride on the Park Pobedy escalators can take almost 3 minutes. Why such a long escalator? A little something called the Cold War – subways stations built in the post-WW2 era were often sited very deep so that they could double as fallout shelters if needed. Ultra-long escalators are long for one reason or another; ultra-short ones… well, their reasons for existing are not so easily discerned. 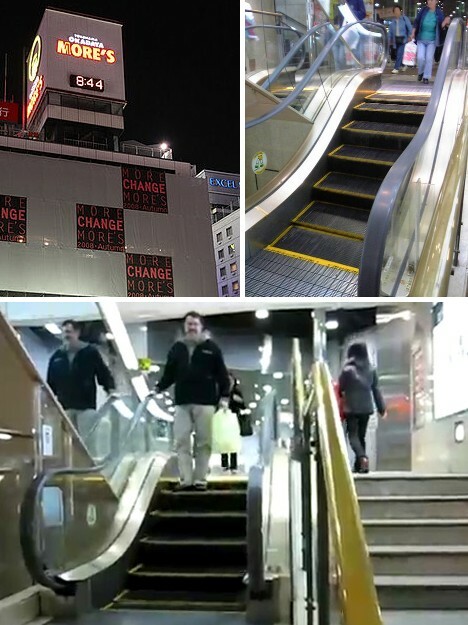 Take the escalator at the Okadaya Mores shopping mall in Kawasaki, Japan, for example… but don’t blink or you’ll miss it. 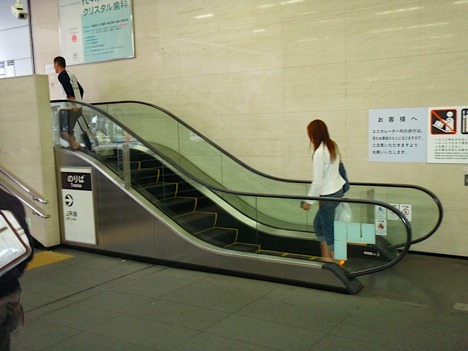 This ridiculously short – only 5 steps – escalator features a vertical rise of just 32.8 inches (83 cm). My guess is, the contractor had some leftover construction materials and thought it better to use them instead of dumping them. You normally wouldn’t associate escalators with skyscrapers; that’s where their cousins, elevators, come in. 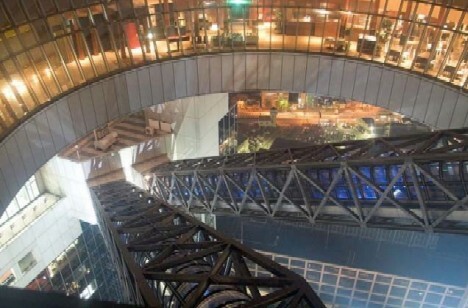 Then there’s the Umeda Sky Building in Osaka, Japan, the city’s seventh-tallest building. 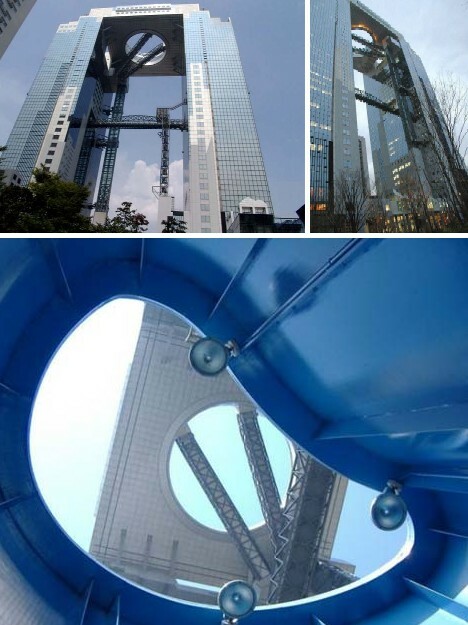 The 568 ft (173 m) high building was completed in 1993 and consists of two 40-story towers with a series of escalators providing access to and from the top 2 stories. A circular atrium piercing the roof and upper levels of the building is bisected by a pair of escalators. One can’t designate any one escalator as “the narrowest”, as escalators roughly 16 inches (40 cm) wide were a standard size back in the day. 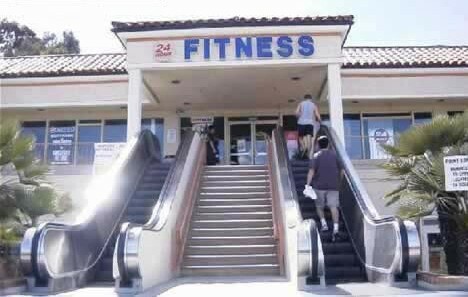 Often installed by department stores and at transit (usually train) stations, these narrow escalators made side-by-side riding impossible and, given America’s skyrocketing obesity rate, would prove to be a challenge for a growing number of horizontally-challenged riders. Curved escalators are a recent development in architectural infrastructure that has perhaps been overly hyped. 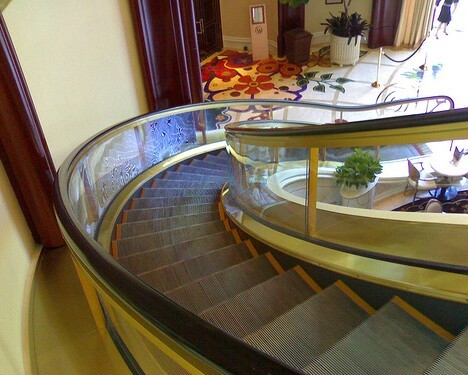 While visually and aesthetically pleasing, the engineering behind curved escalators is rather run of the mill. 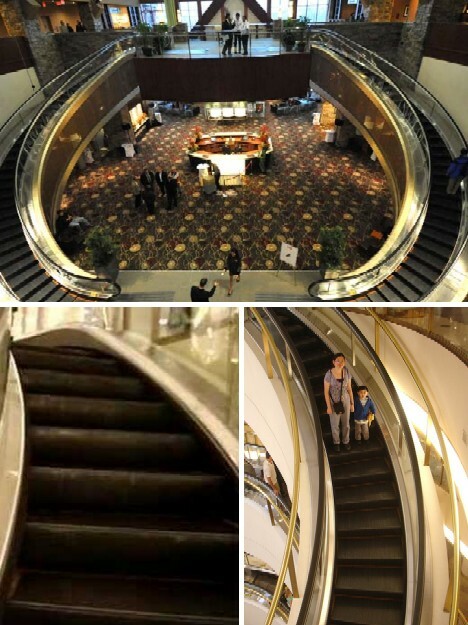 That doesn’t stop the hotels, malls and other buildings that have installed curved escalators from celebrating them as something akin to a Star Trek transporter. Take the twin curved escalators at Canada’s River Rock Casino Resort… they were inaugurated with a flashy ceremony that included a chef knocking the top off a champagne bottle with a saber. 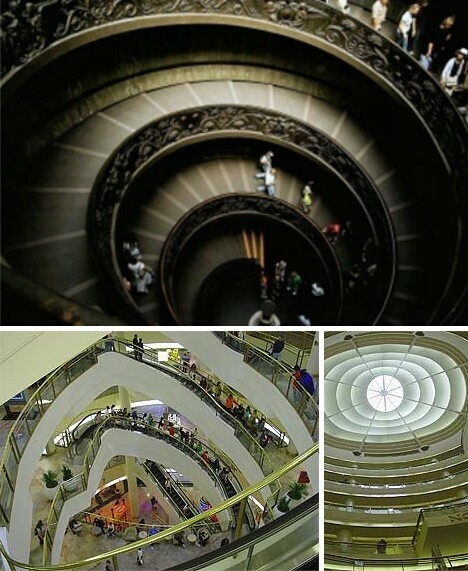 Spiral escalators are basically an extension of curved escalator engineering – just continue the curve long enough so that the escalator spirals in upon itself. Not to downplay the visual impact of spiral escalators to those riding them – it can be a remarkable experience. 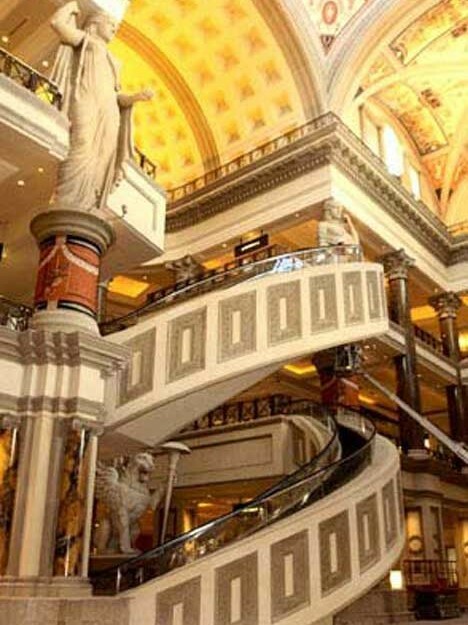 Spiral escalators have been installed at Wheelock Place in Singapore, Saudi Arabia’s Jeddah Hilton (sounds like Paris’ other sister), the Landmark Tower in Japan, the Times Square shopping mall in Hong Kong, Lotte World in South Korea, The Venetian Hotel and Casino in Macau, Wynn Las Vegas and The Forum Shops at Caesars in Las Vegas, Nevada (below), and the San Francisco Centre in San Francisco, California. 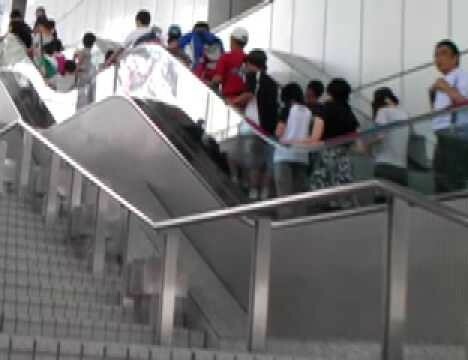 Now here’s an escalator most have never heard of, let alone experienced: the staggered escalator. 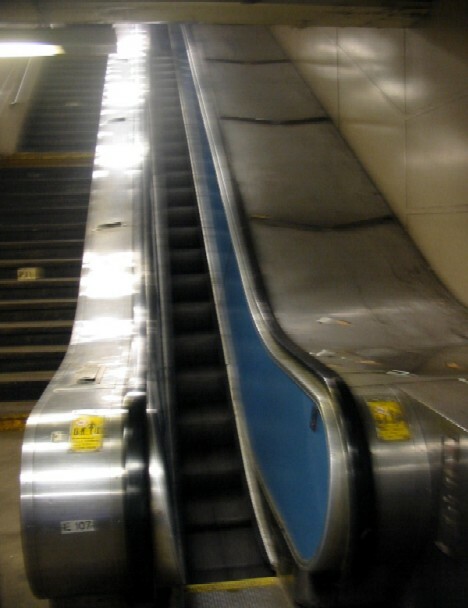 This type of escalator alternates diagonal sections with short flat intervals, possibly to ease any feelings of vertigo that may be felt by riders. Other explanations center on whether the escalator was built over an existing staircase which rose at an angle incompatible with the escalator’s proper function. 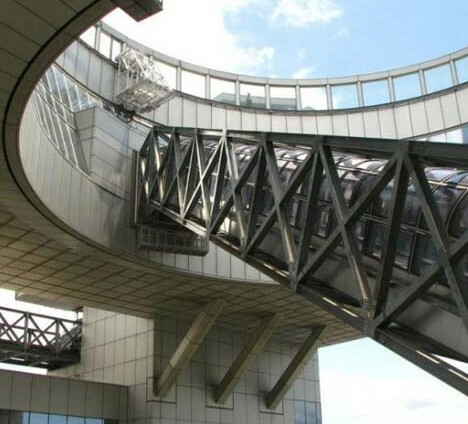 Though most staggered escalators are long and feature short flat sections, the escalator at Tokyo’s Fuji TV Building alternates flat and diagonal sections so that riders appear to be riding a stegosaurus’ back. 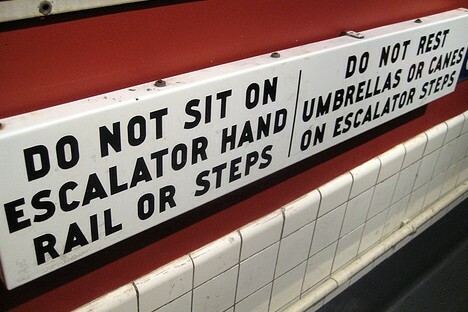 Outdoor escalators present engineers with unique challenges, including what to do in the event of inclement weather. Covering the tracks is one option though the cost is prohibitive in many cases. 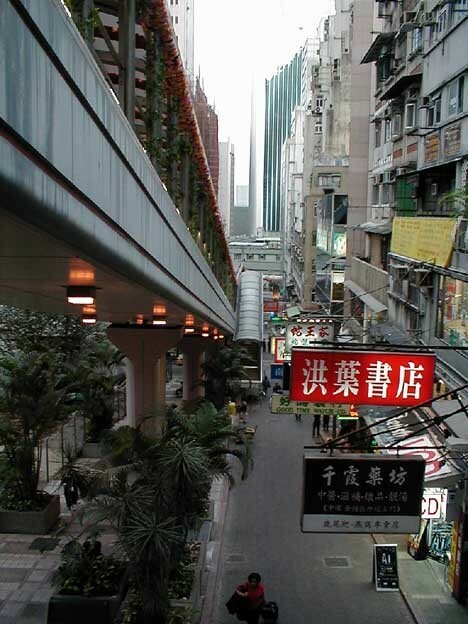 Not in Hong Kong, however, where the world’s longest covered outdoor escalator system snakes its way up and down, uptown and downtown. 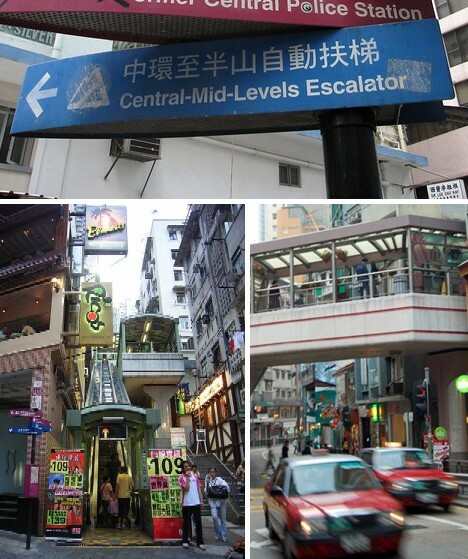 The Central Mid Levels Escalator and walkway system spans a total combined length of 2,626.66 feet or approximately 800 meters). Interestingly, the escalator only runs in one direction at a time depending on the predominant traffic flow during the morning and evening rush hour. When is an escalator NOT an escalator? When it’s a bike-a-lator, in essence an escalator for bicycles. 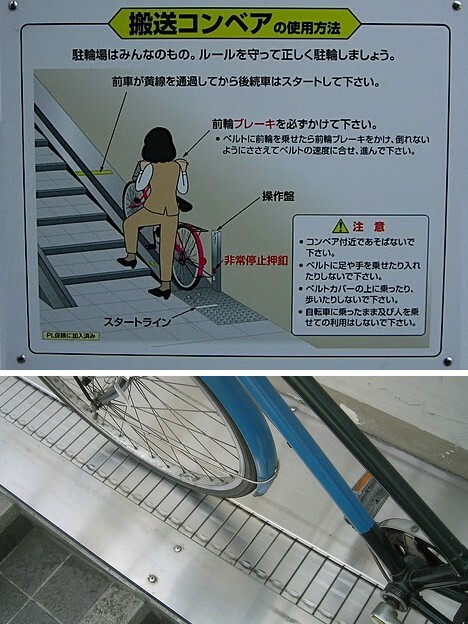 Developed with the needs of city housewives in mind, the bicycle escalators found on some of Japan’s large cities feature narrow slots wide enough to rest the user’s bicycle wheels. 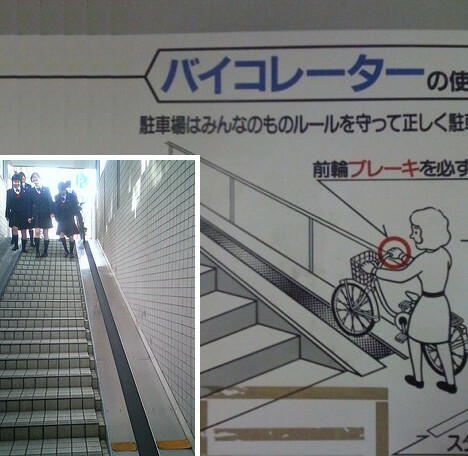 The dismounted rider then walks up the steps, holding the bike’s hand brake, while the escalator smoothly moves the bike along a track set beside the stairs. Escalator Safety: It’s A Croc! It’s been mentioned that escalators are considered utilitarian… unfortunately to some that means they can be taken lightly with no regard to safety. Not so! 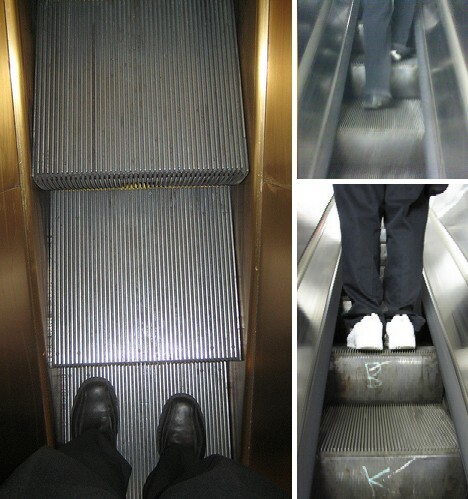 Accidents – some fatal – occur with disturbing frequency on escalators. 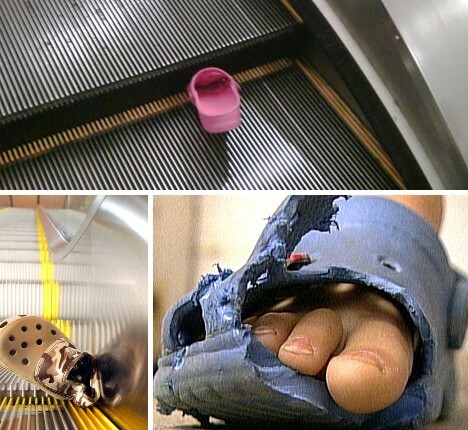 Those trendy Crocs sandals were implicated in a rash of escalator accidents, most involving children, in both the USA and Japan several years ago. Escalators are our friends… use them wisely and they can make life less tiring and more convenient. Use them unwisely and, well, don’t be surprised if the situation escalates.